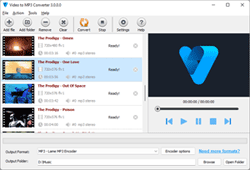 Free Video to MP3 Converter is a versatile tool that can convert video files in different formats to MP3 audio files. The primary function of the Free Video to MP3 converter is extracting audio track from video clip and convert it to audio file. You can set the output audio bitrate, frequency and channels or save audio in lossless WAV format.